What is a dentist’s favorite animal? Okay, bad joke. But it may be a jewelers favorite animal… read on! With 110 sharp, interdigitated teeth in its long, thin snout, it is well adapted to catching fish, its main diet. The male gharial has a distinctive boss at the end of the snout, which resembles an earthenware pot known in Hindi as ghara. The gharial’s common name is derived from this similarity. Their elongated, narrow snout reduces resistance to water when hunting fish, while the very sharp interdigitated teeth are well adapted for capturing them. Young gharials eat insects, tadpoles, small fish and frogs. Adults feed on fish and small crustaceans. Their jaws are too thin and delicate to grab larger prey, especially people. They catch fish by lying in wait for fish to swim by, and then catch the fish by quickly whipping their heads sideways and grabbing it in their jaws. They herd fish with their bodies against the shore, and stun fish using their underwater jaw clap. They do not chew their prey, but swallow it whole. 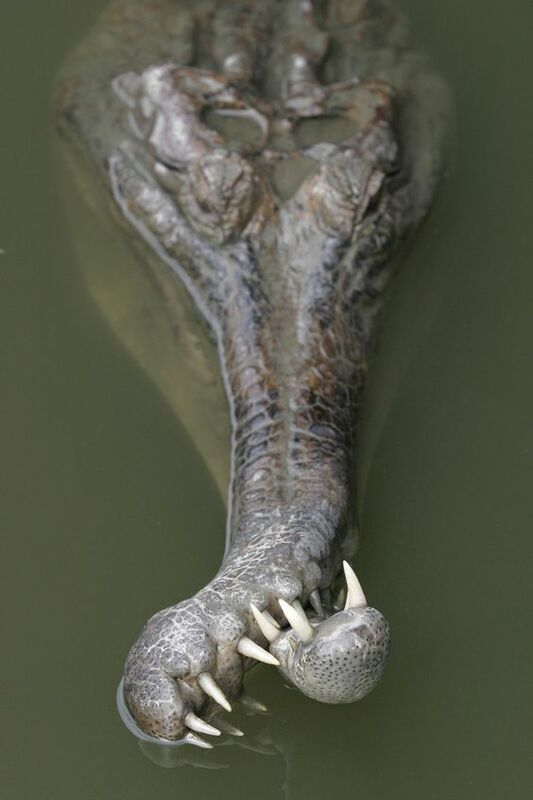 Gharials do not kill and eat humans. Jewellery found in their stomachs may have been the reason for the myth that gharials are man-eaters. They may have swallowed this jewellery as gastroliths used to aid digestion or buoyancy management. Read more about the gharial on Wikipedia.